What’s the best way to educate potential patients? In Person! Many people have not been to physical therapy and may wonder what goes into a course of PT treatment. Will it feel like a workout with a personal trainer or an alignment at the chiropractors? One way to demonstrate the types of treatments and their effects is to host a physical therapy workshop. This gives you the opportunity to show prospective patients PT in action, share your expertise, and help them feel better—building community engagement and public relations for your practice. You want your workshop to be held in a space that easily accommodates demos and exercises without a lot of set up. And, you want to attract attendees who can really feel the benefits almost instantly. 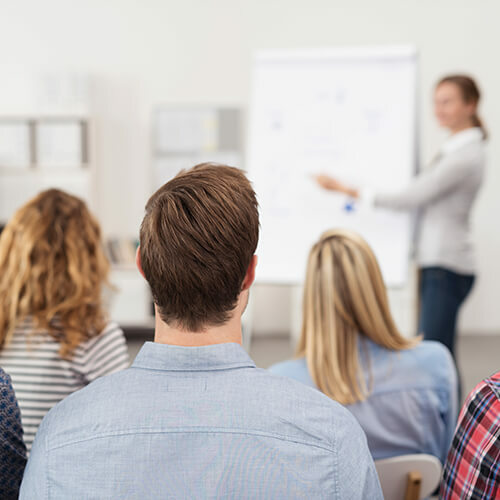 Look for community centers, retirement communities, or athletic facilities that have large, open rooms with space for both a seated information session and active demos. Open houses are best suited for general interactions and can be held at the clinic to show off your practice. Physical therapy workshops should bring your services into the marketplace and create a comfortable space. Invite groups of people who already have a shared connection, which can encourage attendance and provide support. Groups such as retirement communities, civic groups, or faith-based programs can be a great source of connections. You don’t want to have 30 people show up in a space that is meant for 12. They might feel crowded or have trouble hearing/seeing the presentation. Plan the maximum headcount so that each person can have both a chair for the info session and a floor space, say the size of a yoga mat, for interactive demos. You also don’t want only a few people to show up as they might feel uncomfortable trying exercises in a small group. We recommend having at least 6 people to encourage engagement and boost morale. Remember in college when your professor droned on and on about something and you felt like you were in a trance. Don’t become Professor Boring! Plan your content and agenda to keep the audience engaged. Start with an activity. This immediately sets the tone that you will be hosting a fun, interactive physical therapy workshop. Ask participants to do a few simple stretches in their chair to gauge their mobility and flexibility. Keep the presentation short and relevant. Don’t go into philosophical backgrounds or the history of PT. Focus on your clinic, your services, your certifications, introduce staff at the event, and emphasis the benefits of PT. Change presenters. As the practice owner, you should probably lead the presentation and then let a lead PT coordinate the demo. But, if you really aren’t a fan of public-speaking, then let someone who likes the stage take the lead. Introduce yourself and spend time creating one-on-one interactions with attendees. It’s a no-brainer to bring your practice brochures and flyers, but be strategic about how you hand them out. Giveaways, food, and drinks always add to the event and you can quickly throw together a strong physical therapy workshop spread. Use your brochure during the information session. Have a copy available on every seat and walk through your services, practice history etc. during the presentation. This makes the participants actually read your brochure and get valuable information. Have plenty of old newsletters available. Bring several on a variety of topics and have extra copies to encourage attendees to share them with family and friends. Also, have a sign-up station where people can opt-in to receive mailed newsletters and other promotions. Bring fun, seasonal giveaways. If you are hosting a physical therapy workshop in the warm weather, bring sunblock sticks and water bottles with your practice logo. Cold outside? Create small goodie bags with tissues, chapstick, and hand sanitizer for some healthy winter giveaways. Keep the food and drinks simple. You want people to remember the workshop and not the meal. Opt for healthy options like veggies, dip, crackers etc. Avoid nuts and other allergens. Go for individual drinks, like mini water bottles or juices, that don’t require pouring and open cups. Spills and hot beverages can create commotion and a mess during the demo. Hosting physical therapy workshops gets easier with practice. Set a goal to host one a quarter each year and try a variety of formats and venues. Tailor the presentation and demo to the intended audience, such as mobility and balance for seniors and injury prevention with flexibility for athletes. Our last tip is to have a follow-up engagement plan. Send a thank you letter to attendees approximately 1-2 weeks after the workshop to remind them to come see you for PT. Include a promotion such as a free screening and track the responses!